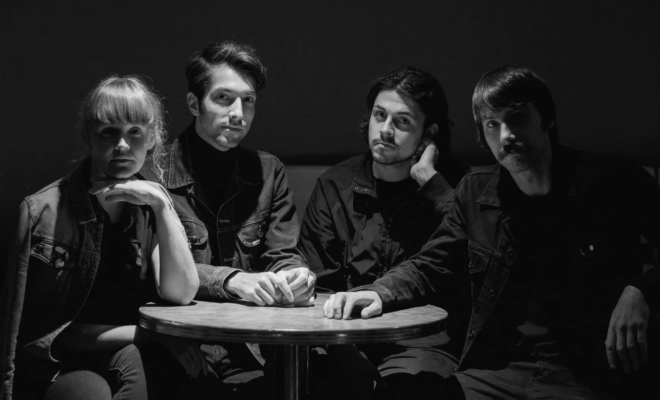 Run Coyote, the four-piece rock band from Toronto, Canada has exclusively premiered their latest single with Stage Right Secrets, “The Chase.” The song comes from their upcoming album In Shadowlands which debuts on So Sorry Records on April 26. Fans can preview and preorder the album HERE. The band is comprised of brothers Sam (guitar/vocals) and Jake Allen (guitar) along with Amanda Grant (vocals/bass) and Jeremy Ramos-Foley (drums) and is bringing their own brand of vintage rock to the airwaves. Their sound is described as surf rock with western swagger bringing a unique vibe and all around new genre. “The Chase’ is one of our favourite songs to play live. It features the antihero of our new album. She’s betrayed, tries to take justice into her own hands, and is then pursued by a private eye across city and desert, under the night sky. With our new album, ‘In Shadowlands’, we tried to marry our love of Film Noir with Spaghetti Westerns through late night rock’n’roll songs and I think this song is a great representation of that,” said Sam Allen.